Here’s another very simple dish I’d like to share with you. It’s called Madoya (pronounced ma-dô-ja), lightly battered then fried slices of banana. The photo below was taken over 20 years ago. My parents and aunt/uncle used to grow and sell vegetables at the (then) Harmon flea market, then subsequently at the Dededo flea market. I used to LOVE going with them. We’d get to the flea market well before any roosters were awake to set up our stand. 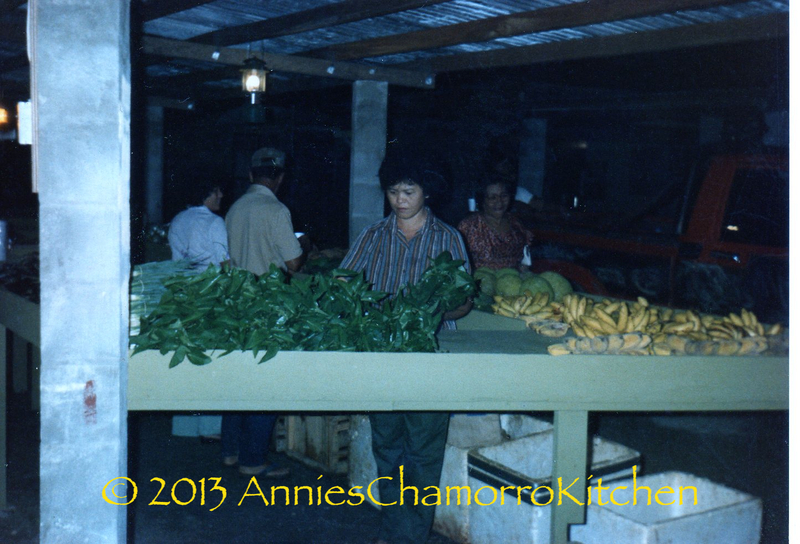 This photo shows (from L-R) my aunt, dad and mom (and another vendor checking out the competition) setting up green onions, kangkung, bread fruit, and several varieties of bananas for sale. That’s Saba banana in the bottom left. 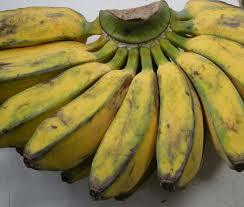 This is a close up view of Saba banana. It’s a great cooking banana, and is great for making madoya, golai åppan (bananas cooked with coconut milk and sugar), banana lumpia, grilled bananas, or even eaten as-is. I didn’t have any Saba bananas today, but I did have ripe plantains. 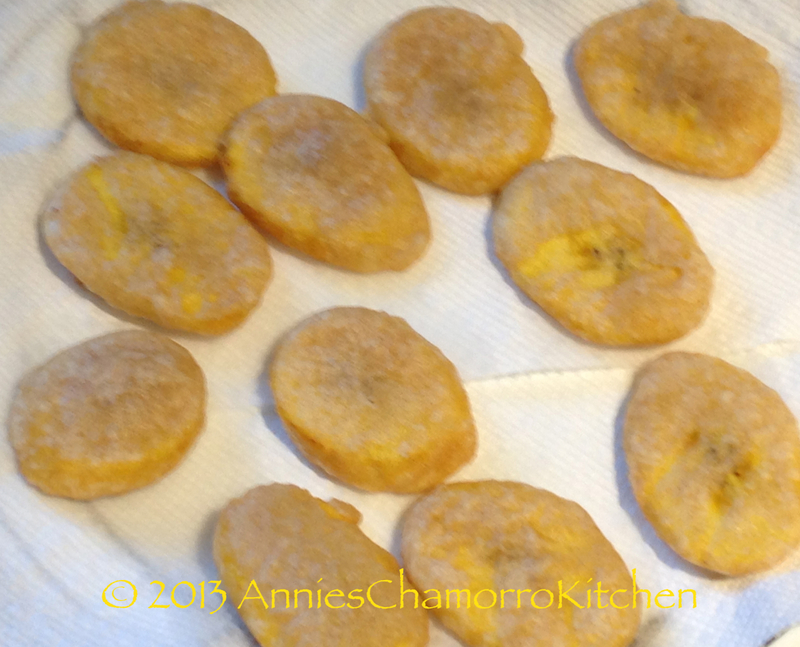 Be sure to read my post for grilled plantains — I have photos showing what ripe ones look like. When I make madoya, I like for the banana to be the star of the show. Therefore, I don’t make a super thick batter. 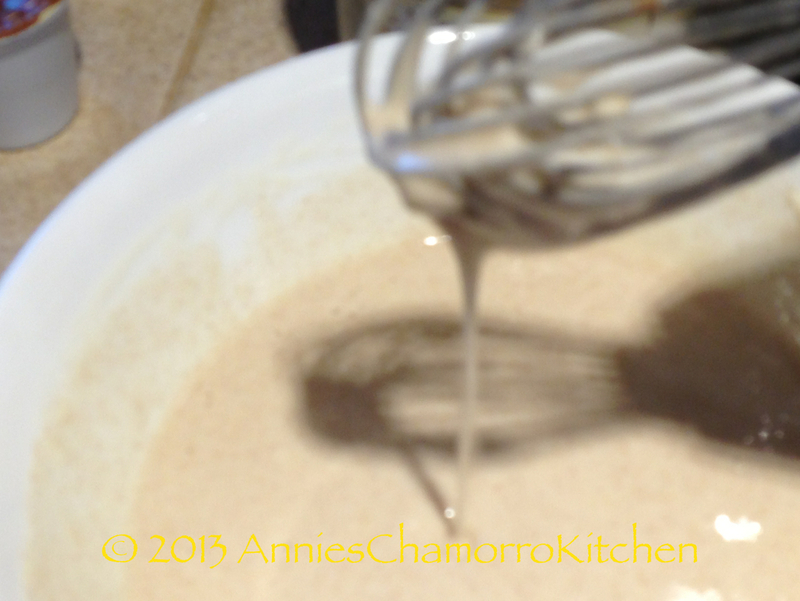 Instead, I make my batter thin, yet still thick enough to provide a nice coating when fried. 1. 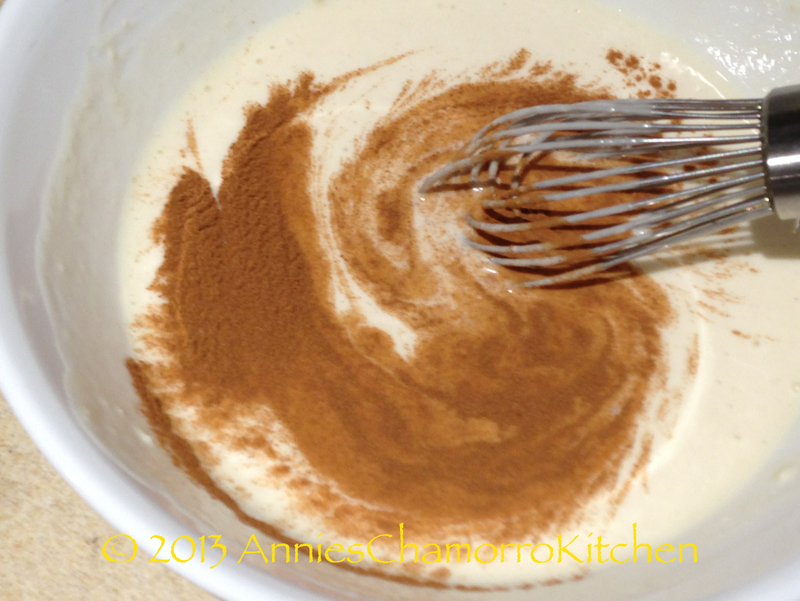 In a small bowl, whisk together the flour, water, cinnamon and sugar. 2. 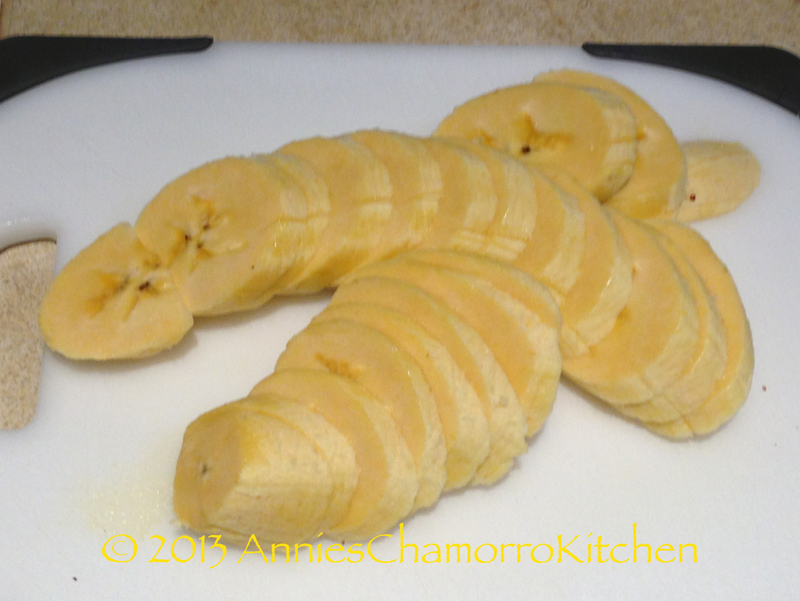 Peel and slice the plantains into small slices (you can also slice them length-wise instead of across). 3. Place the banana slices into the batter. 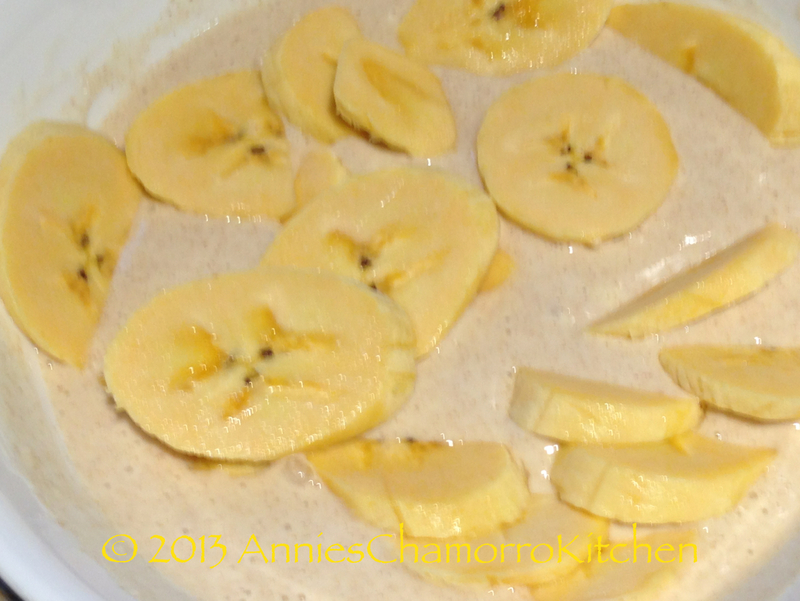 Use a fork to gently stir the slices into the batter, carefully separating them (be careful not to mash the bananas). 4. Heat your oil. Once the oil is ready, carefully drop in each slice. Don’t put too many in at once or else they will stick together. 5. Fry until golden brown on both sides. 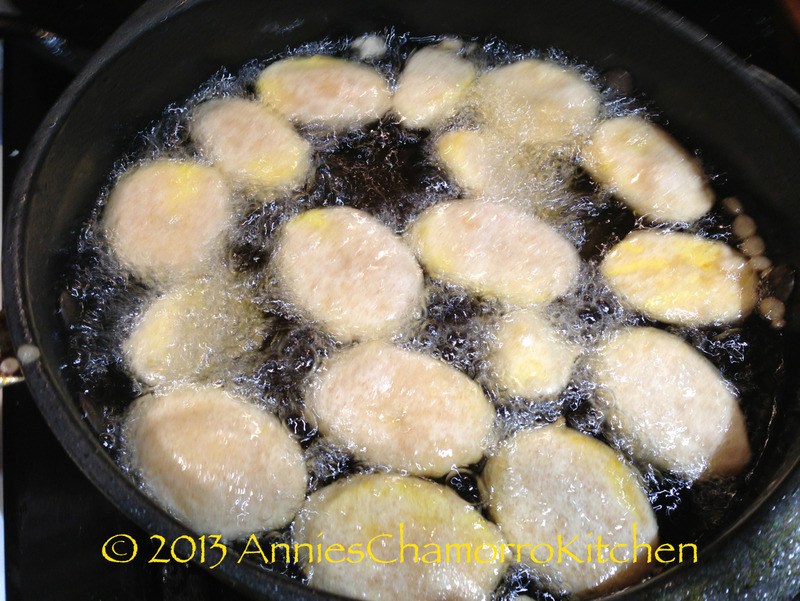 Remove from the oil; place the fried bananas on papers towels to drain. Serve and enjoy!